Supreme Court Neil Gorsuch: Who is Trump's nominee? 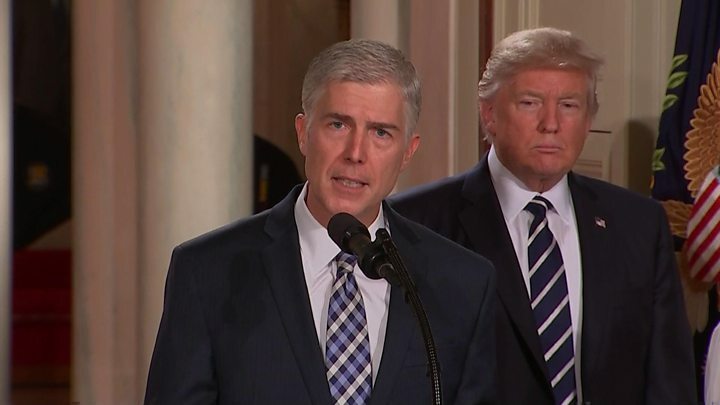 President Trump's Supreme Court pick, Judge Neil Gorsuch, is the youngest such nominee in a quarter of a century. The 49-year-old Colorado native, whose legal pedigree includes Harvard and Oxford, would succeed the late Justice Antonin Scalia if confirmed. He is favoured by many conservatives who consider him to espouse a similarly strict interpretation of law as Scalia. Judge Gorsuch was first nominated to the 10th US Circuit Court of Appeals by former President George W Bush in 2006. Judge Gorsuch began his law career clerking for Supreme Court Justices Byron White and Anthony Kennedy, the latter of whom he could now serve alongside. Media captionPresident Donald Trump: "Was that a surprise? Was it?" He worked in a private law practice in Washington for a decade and served as the principal deputy assistant associate attorney general at the Justice Department under the Bush administration. Judge Gorsuch graduated from Columbia University and Harvard Law School, where former President Barack Obama was a classmate, and earned a doctorate in legal philosophy at Oxford University. Perhaps it was during his time in England that he accumulated what his former law partner, Mark Hansen, has said was "an inexhaustible store" of Winston Churchill quotes. Judge Gorsuch - who reportedly likes to fly-fish and hunt - lives in Boulder with his wife Louise and two daughters, where he is also an adjunct law professor at the University of Colorado. If confirmed by the Senate, he would become the only Protestant on the current bench. The other justices are Jewish and Catholic. His family is well-connected in Republican establishment politics. His mother, Anne Gorsuch Burford, was the first female director of the Environmental Protection Agency during the Reagan administration. He is known for his clear and concise writing style, navigating the most complex legal issues as deftly as the double-black diamond slopes on which he is reputedly an expert skier in the snow-capped mountain state he calls home. Judge Gorsuch's published writings reveal his conservative leanings. He argued against euthanasia in his 2006 book The Future of Assisted Suicide and Euthanasia. "All human beings are intrinsically valuable and the intentional taking of human life by private persons is always wrong," he wrote. In a 2005 article in the National Review, Judge Gorsuch argued that "American liberals have become addicted to the courtroom". He said they keep "relying on judges and lawyers rather than elected leaders and the ballot box, as the primary means of effecting their social agenda". Judge Gorsuch has never ruled on abortion, and he is not expected to call into question high-profile rulings on that issue or gay marriage. His conservative outlook cements Mr Trump's campaign promise to nominate a judge "in the mould" of Justice Scalia, restoring the nine-seat high court's 5-4 conservative majority. Much like the late Scalia, the Ivy-League educated judge is known to support textualism, or the interpretation of law according to its plain text. He also maintains a strict interpretation of the US Constitution, or how it was originally understood by the Founding Fathers. 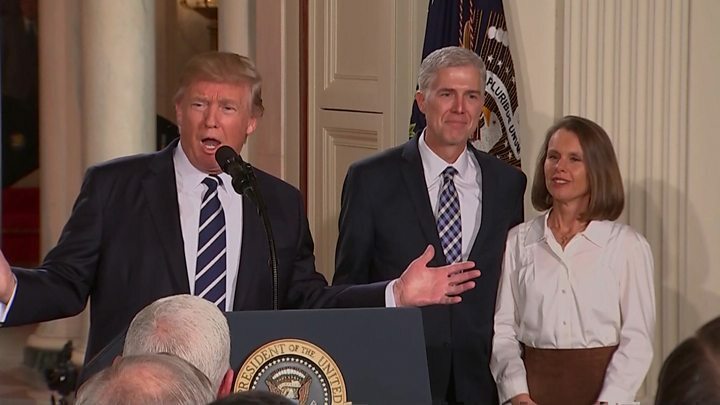 While sitting on the bench of the 10th Circuit, Judge Gorsuch sided with groups that successfully challenged the Obama administration's requirements for employers to provide health insurance that includes contraception in the Hobby Lobby Stores v Sebelius case. Judge Gorsuch has also expressed concern about "executive overreach", a criticism that was often directed at the Obama administration's use of presidential orders to overcome congressional gridlock. 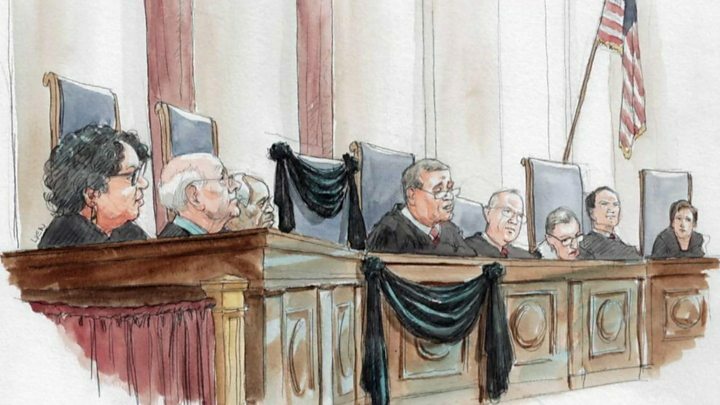 He has sharply questioned a landmark Supreme Court ruling determining that courts should defer to government agencies when it comes to interpretations of ambiguous federal laws. Conservatives blame the 1984 decision involving the Chevron oil company for handing too much power to the regulatory state. In an August 2016 concurring opinion, Judge Gorsuch wrote that "executive bureaucracies [were being allowed] to swallow huge amounts of core judicial and legislative power and concentrate federal power in a way that seems more than a little difficult to square with the Constitution of the framers' design". In a 2013 case, he upheld a lower court's ruling that a police officer was protected under qualified-immunity law after he used a stun gun on a 22-year-old student, who died from the incident.